Stems: Decumbent or prostrate, stout, 4 to 28 inches long, much-branched below middle, minutely stiff-hairy, forming bushy mats. Leaves: Alternate, mostly sessile, odd-pinnately compound, 1.5 to 4.5 inches long; leaflets 9-21, narrowly linear to filiform, somewhat sickle-shaped, 1/2 to 3 inches long, less than 1/10 inch wide, stiff, short grayish-white pubescent; tips pointed; terminal leaflet continues rachis. Inflorescences: Racemes, spike-like, 7-30-flowered, on stout stalks 1 to 4 inches long. Flowers: Calyx tube cylindric, 5-toothed, minutely white to blackish-hairy; corollas papilionaceous, 3/4 to 1 inch long, creamy-white, dry yellowish; banner petals deeply notched, much larger than wing and keel petals. Fruits: Pods, oval, 1/2 to 1 inch long, straight to slightly curved, firm; tips elongate points; seeds smooth, shiny, pale brown. Habitat: Dry, sandy or gravelly hillsides and plains, most abundant in shale or chalk soils. Distribution: West 1/3 of Kansas. Comments: Tine-leaved milk-vetch accumulates selenium from the soil. Livestock rarely consume it but can be poisoned if they do. Selinium poisoning is known as "blind staggers" and "alkalid disease". 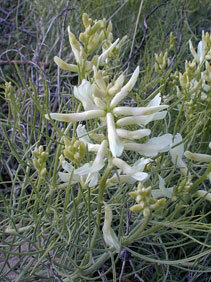 See Prince's plume (Stanleya pinnata) for a description of symptoms.